Engineers are always in demand. So, you don’t need to worry about making the best mechanical engineering resume, right? Yes, it may seem like mechanical engineering jobs are low hanging fruit. But, even when you’re just starting - you’ve got a lot of technical experience and education to organize and present. Plus, you’ve got the competition to think about. So, do you want to make your recruitment process a breeze and snap up the best jobs fast? Well, then consider putting a little extra effort into writing your mechanical engineer resume. No, it doesn’t involve a lot of writing. It’s about piecing everything together into a well-oiled machine. A mechanical engineer resume example better than 9 out of 10 other resumes. How to write a mechanical engineering resume that will land you more interviews. Tips and examples of how to put skills and achievements on a mechanical engineer resume. How to describe your experience on a resume for a mechanical engineer to get any job you want. Here's a sample resume for a mechanical engineer made using our resume builder. Mechanical Engineering Resume Examples - See more templates and create your resume here. What’s the Best Format for a Mechanical Engineering Resume? You know that saying “content is king?” For a marketing job or a sales gig that’s true. Your documents should reflect your ability to brand and sell. But when it comes to a standard mechanical engineering resume, the design also matters. That’s because it’s best when your resume reflects a key skill set in action. So, let’s start with format and layout. The reverse-chronological format is the most common. At the same time, it’s the best mechanical engineering resume format. That’s because your most recent experience or education comes first. It’s a bit like an advert with the selling point at the top of the page. The combination resume format is a good choice if you’re switching industries or have had a long career. The format allows you to show off your skills before highlighting your experience. All you have to do is use skills as subheadings in the experience section. Mechanical engineering is a skills-based profession after all. When it comes to layout and design, choose a clean, straightforward layout or template. Filtering out resumes for mechanical engineers is easy when you start with the ones that look strange. 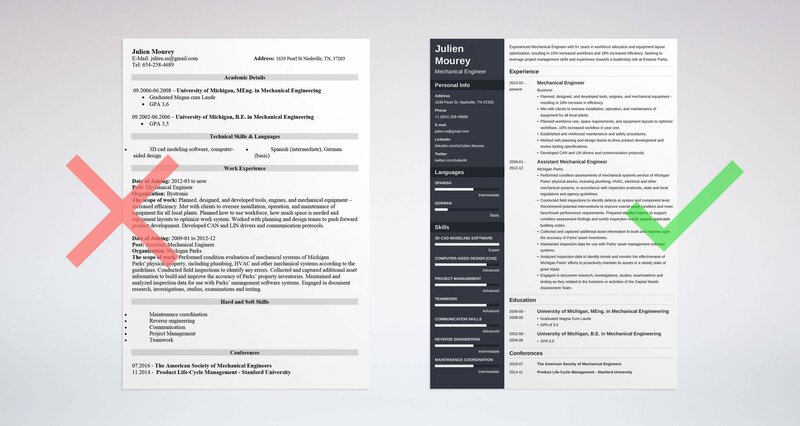 Use a good mechanical engineering resume template that balances text and whitespace. Use the same font and spacing throughout the document. Finally, make strategic use of bold, caps, and italics. Pro Tip: Proofread. You can have the most beautiful, impressive resume in the world and fail to land the job. Why? Typos, misspellings, and grammar errors. So, be sure to proofread your mechanical engineer resume before sending it. Mechanical Engineering - Resume Summary or Resume Objective? The first thing an employer needs to know is where you are in your career. You’re applying for an engineering internship and need a professional resume. You’re a fresh graduate and are looking for your first permanent job. You’re an experienced person who has a lot of value to showcase. Interns and fresh graduates should kick off their entry-level resumes for mechanical engineering jobs with resume objectives. You’ll place this under your contact information. A resume objective tells a hiring manager where you are and where you’re going. Plus, it tells the hiring manager why you’ll be a valuable hire and a good fit for the role. Take a look at the example mechanical engineer resume objectives below. Organized Mechanical Engineer Student preparing for a BSc in Mechanical Engineering at Columbia University. Looking to leverage excellent data assimilation and research skills during a summer internship at Micron Technologies. Previous internship experience at SpaceX. Undergraduate studying for a BSc in Mechanical Engineering, looking to obtain a summer engineering internship at Micron Technologies. Old school resume objectives are not in fashion. Don’t tell hiring managers what you want. Tell them that you’ve got what they want. Outgoing Mechanical Engineer Graduate with structural knowledge of DRAM, CMOS and NAND Imager. Took part in the SAE International Formula SAE program to build a single-seat racing car. Have an MSc in Mechanical Engineering from Columbia University. Mechanical Engineer from Columbia University with an MSc in Mechanical Engineering. Seeking to obtain experience as a Mechanical Engineer in a position with your company. You’ll want to add skills and experiences. Match them to skills listed in the job offer. A professional mechanical engineering resume summary is also a few lines at the beginning of your resume. The difference is that it focuses on work experience tailored to the job description. Engineer and Design Engineer. Can perform static, fatigue, and fracture analyses for F-35 structural components of main landing gear. Seeking to leverage project management skills as a Mechanical Engineer at XYXY company. Analytical Mechanical Engineer with 2+ years’ experience working for Rotation Engineering as a Stress Engineer followed by one year as a Design Engineer. Hard working and ambitious. Add a couple of tangible skills to the mix. That way the hiring manager can see what you’ve done right away. Pro Tip: Let’s say you’re applying in response to a job offer full of technical skills and software requirements. You can start your experienced mechanical engineering resume sample with a profile summary. 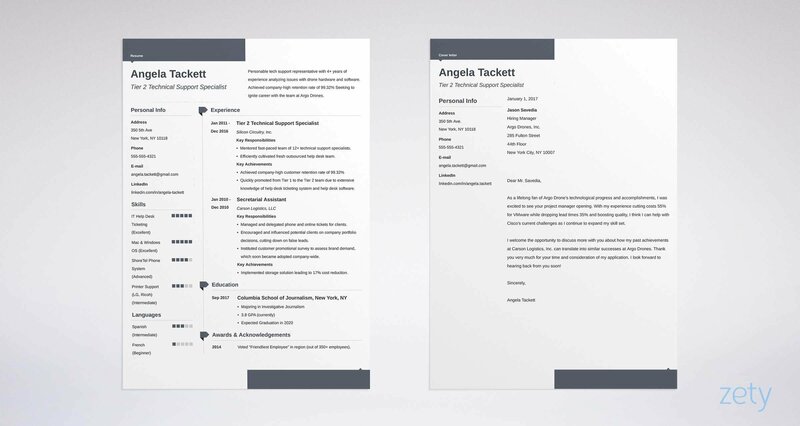 A profile summary is a bullet point list of your best skills and experience at the very top of your resume. Start with your most recent job and list up to six responsibilities under each one. Tailor the information to the job description. Back up your duties with technical skills. And don’t be afraid to be technical. Yours is a technical world. Details are good. At the same time, avoid jargon. The exception is if it’s in the job offer. Otherwise, remember that a non-technical HR recruiter might read your resume first. In that case, it’s best to tailor your resume for a mechanical engineering job to match the language of the job offer. So spell out names. Don’t use jargon. Be precise, concise, and honest. Plan, design, and develop tools, engines, and mechanical equipment - resulting in 18% uplift in efficiency. Meet with clients to oversee installation, operation, and maintenance of equipment for all local plants. Plan workforce use, space requirements, and equipment layouts to optimize workflows. 10% increased workflow in year one. Establish and reinforce maintenance and safety procedures. Develop CAN and LIN drivers and communication protocols. Another thing to remember is to use the active voice opposed to the passive. A 20% increase in efficiency was achieved. Also, notice that in the sample above each line starts with an action verb. How many times have you used “responsible for” on your mechanical engineer resume so far? More than once? Then consider swapping them out for action verbs. The added benefit? Companies are on the lookout for candidates who are not only talkers but doers. Action verbs help you project that image. Pro Tip: One thing you’ll want to do is highlight accomplishments. If some of your activities have contributed to a company’s success - be it efficiency or cost savings - highlight it. Explain how your role played an important part. Everyone here has a higher degree - whether it's a Bachelor of Science or a Master's of Science. Some of you might even have a Ph.D.
That’s makes adding your education pretty simple. Start by deciding where to put your education on your mechanical engineer resume. If you’re a engineering college student, you might want to put it first after your resume objective. Did you complete lots of engineering internships? Are you an experienced engineer? Then consider putting your experience section first and your education second. Then all you have to do is include the name of your university, your degree, and the year you graduated. Start with your most recent degree. Pro Tip: Only add your GPA to your college mechanical engineering resume sample if you graduated in the last three years. Also, do not add your GPA if it was below a 3.5 average. Before you start listing your skills, take a good look at the job description. Proficiency using 3-D CAD modeling software to design (Inventor preferred). Proficiency with AutoCAD 2-D design software. Verbal and written communications is essential. Ability to create machine manuals and assembly procedures. Proficiency with motor, drive train, and bearing analysis and application. Make sure that you match the employer’s requirements with your qualifications. Employers like to be able to see at a glance what technical skills candidates have. Notice that there are both hard and soft skills listed in the job offer. Hard skills are the technical skills needed for mechanical engineering jobs. Soft skills are the essential people skills required for you to work well. So, what skills do you need to be a mechanical engineer? So, what might your experienced mechanical engineering resume skills section look like? Now, your employer may scan your resume using Applicant Tracking System (ATS) software. The software scans your resume for keywords and phrases from the job description. That’s why it is best to add some phrases from the job description in their entirety. So, it’s best if you list it on your resume for a mechanical engineer the same way. Pro Tip: You don’t have to list all your skills and abilities in your skills section. Scatter them throughout your resume. Use your skills section to show off your best skills and to plug the most mandatory skills. Adding other sections to an experienced mechanical engineering resume sample is an effective way to organize your information. Mechanical engineering is both a technical and academic pursuit. That means most professionals can come up with something extra that would shine on a resume. Whether it be awards, software, or languages. Just make sure that you don’t over do it. You still want to aim for a one-page mechanical engineer resume if possible. Pro Tip: Consider adding hobbies and interests to your model mechanical engineering resume template. Why? You can match them to reflect the company’s work culture to show that your personality is a good fit. Many employers are looking beyond technical skills to personality. Some will say that sending a cover letter with your engineering resume is a waste of time. Why? Because most employers don’t read them. And besides, you work with machines, not with people. Right? So, why should you have to write something? Well, writing skills happen to be some of the most valued in any profession. And cover letters are a great way to show off yours. Plus, cover letters are a great way to go into things that you couldn’t with your mechanical engineering resume. And let’s not forget the simple fact that there are still an awful lot of employers out there who do read cover letters. Aim to be conversational in tone, but don’t ramble or try to be funny. At the end of the day, this is a business proposition. So it should be reasonably business-like. Make your points, outlining why you think you are perfect for the role. Avoid hyperbole. Don’t oversell yourself. Just convey the facts behind your experience or career. Writing a solid mechanical engineering resume example isn’t as difficult as it may first seem. And even with opportunity knocking, the tinkering and fine tuning are well-worth it. Think about it like this - you can get a job, or you can get THE job. It’s all in the details. All you need is a bit of know-how (it’s not rocket science), and you can take your job hunt to a whole new level of fast and easy. Get it right, and you’ll be motoring. Personalize, Personalize, Personalize. Mention the company in the resume heading. Make yours stand out. Double- and triple-check. Spend an extra few minutes making sure that your mechanical engineering resume and cover letter are up to par. Now. You should have a resume that’s mechanized to perfection and engineered just right. Time to attach the final mech eng. cover letter and resume to an email and send it off! Did we miss anything? If you are still struggling with how to write a mechanical engineering resume, let us know in the comments, and we will do what we can to help. 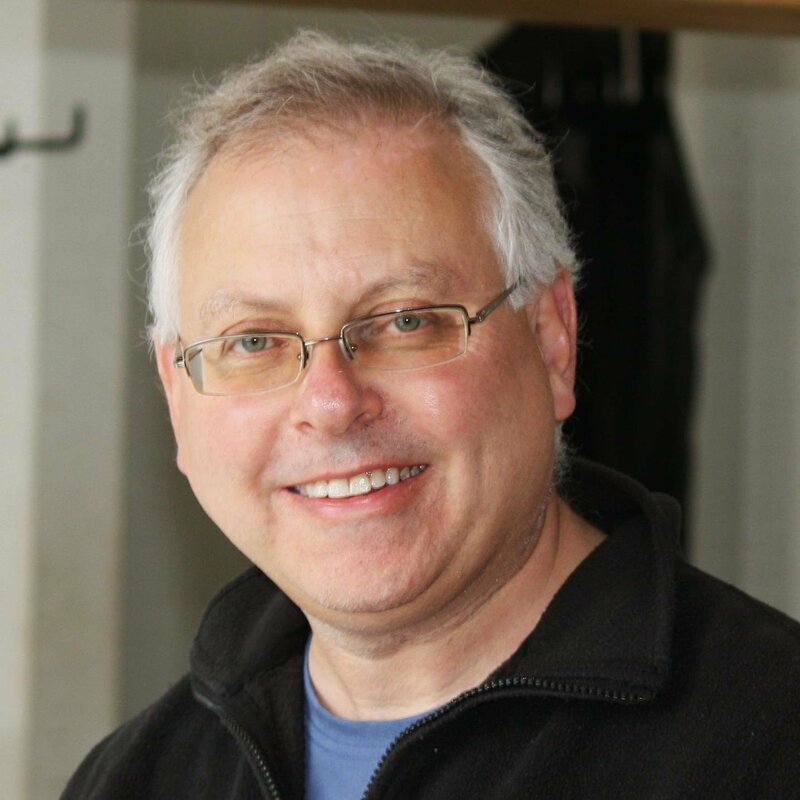 Alex Pearl is a freelance copywriter and author who has written his fair share of resumes over the years.